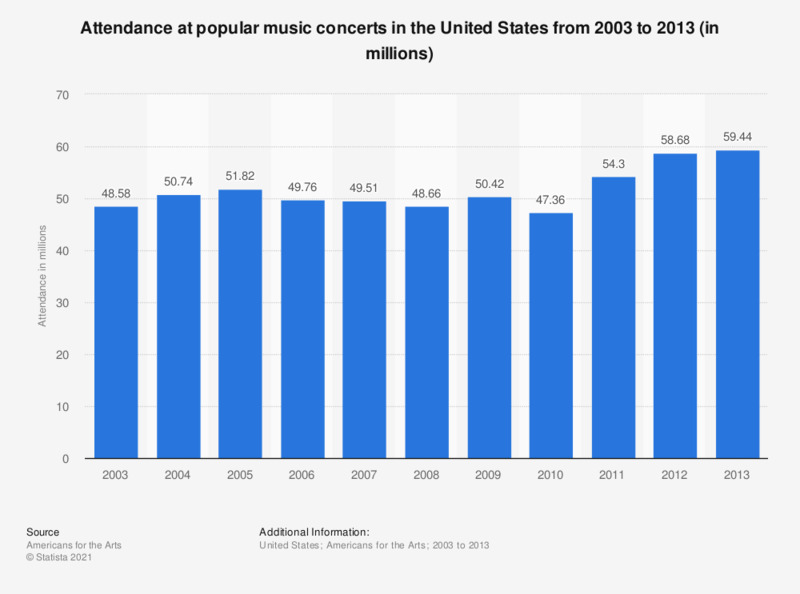 This graph depicts the total attendance at popular music concerts in the United States from 2003 to 2013. In 2013, 59.44 million people attended a popular music concert at least once. In 2016, Beyonce and Guns 'N' Rose were among the most successful music tours in North America, generating 169.4 million U.S. dollars and 130.8 million U.S. dollars, respectively in gross revenue. During that same time, Bruce Springsteen and Coldplay led some of the most successful global tours, generating 268.3 million U.S. dollars and 241 million U.S. dollars, respectively. Ticket sales revenue in North America reached their highest point in 2016, totaling 7.3 billion U.S. dollars. The concert industry is benefiting from increasing number of shows, ticket sales, as well as ticket prices. Foro Sol, a large outdoor venue built in 1993 in Mexico City, had ticket sales amounting to almost one million units in 2016. Live Nation is one of the leading global music promoters, selling over 44 million tickets in 2016. A merger between Live Nation and Ticketmaster formed the current company, Live Nation Entertainment in 2010. It is based in California, United States, and focuses on promoting live music events. Utilization of social media has also enabled a broader market reach. The integration of mobile devices in parallel with the concert experience has allowed for ticket purchases, skipping entry lines, and new apps. Included in popular music concerts are country, R&B, rap, hip-hop and rock concerts. Attendants visited a concert at least once during the past twelve months.